Temperatures will zoom to near 90° for your Saturday here in the Cookeville, TN area with overnight lows of 68° by Sunday at sunrise and then will hit 93° tomorrow with heat index values nearing 100°. Skies will be clear throughout the weekend. Next week's weather will continue the very hot pattern of this weekend with a slight chance of storms each day. We should see a break in this oppressive heat by Friday. With a rash of arrests recently of people who've left kids in the car while they've gone to do other things, I thought this would be a great time to remind folks of just what happens in a car in a short period of time. 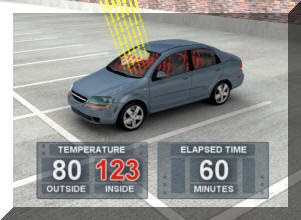 As the graphic above shows, when the temp outdoors is just 80°, a car will heat up to more than 120° in 60 short minutes. This is a death trap for children. Deaths of children left in vehicles has averaged anywhere from 30-47 annually since 1998. This is a SICKENING stat.